Kim & Scott's Gourmet Pretzels add a unique twist to the ancient pretzel by creating a variety of delicious flavors, using custom recipes and premium ingredients. Twisted by hand and baked from scratch, our unique soft pretzels make a wonderful snack anytime! These pretzels are anything but ordinary. Several varieties appeal to a wide range of tastes including the classic salted pretzel, the stuffed pizza pretzel, a gluten-free soft pretzel, and even a nice selection of stuffed bagels. For those of you with a sweet tooth, you won't want to miss the chocolate crumb or cinnamon twist pretzel. What makes these snacks better than the rest? For one thing, these are a healthier choice than most. 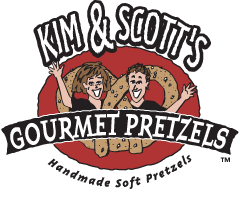 Kim & Scott's Gourmet Pretzel creations are all-natural and contain no preservatives, trans fats, or hydrogenated oil. If allergies are a concern, the pretzels are produced in a nut-free environment and all other allergy information is clearly printed on the box. We tried out the Pizza Stuffed pretzels. I found them in the freezer section and they were about $3.00 a box. I allowed mine to thaw before cooking and they only took about seven minutes in the oven. That was perfect because as soon as the kids saw the box, they couldn't wait! They looked great and smelled delicious. I liked them because there was pizza inside of them. I liked them because them are good and also I liked the cheese and the sauce! I liked them because they were pizza pretzels and they had sauce in them. I liked the pretzels because they tasted good. The pretzel I had was good because of the cheese and sauce. Would you like to try these delicious pretzels? One lucky reader will receive two boxes of Kim and Scott's Pretzels for free! Simply follow the instructions below and I will use random.org to choose a winner on Friday December 2. 2. Follow my blog using NetworkedBlogs. 3 Like my Modest Mama page on Facebook. 4. Like Kim & Scott's Gourmet Pretzels on Facebook. 5. 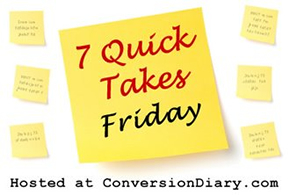 Leave a comment on another Modest Mama blog post. I know you are going to enjoy these tasty treats as much as we did. Good Luck! Disclaimer: I received a free package of Kim & Scott's Gourmet Pretzels in exchange for an honest review on this blog. I received no other compensation. Here's to a wonderful Thanksgiving holiday celebrated with friends and family! Isaac designed a bow and arrow using his pocket knife, a couple sticks, a long rubber band, and a turkey feather. Guess what! It really shoots. I love grandfathers who like to read to their grandkids. I also love grandfathers who believe little boys should have BB Guns to shoot when they have a large family farm to run around on. After over a week of misery from Malcolm, we were able to get him the medicine he needed to return to his cute little self! I was recently able to eat lunch alone at a resturant. It was so wonderful! I ordered soup. Not only was it hot while I ate it, but I didn't have to share a single bite. Hard to believe that Advent starts in two days. This year Advent is the longest that it can possibly be. We are modifying some of our traditions because of this. We are also planning to do a Jesse Tree. Of course, I always plan to do several things during this special holy time, but very few of them ever come to be. There are many products on the market today under the disguise of games intended to teach children to read. Many make claims that children will be reading at young ages, or reading at high levels quickly. Sometimes these games help children excel at reading, but more often than not, these products fall short in the eyes of the consumer. I was fortunate enough to be able to review one such item that not only met but also exceeded my expectations for a game designed to teach beginning reading skills. The Reading Game is a fast-action memory card game that teaches 180 commonly used words over the course of six different levels. Each level is broken down into easily managed "chunks" of word learning. Upon the completion of each level, the child is able to read a storybook that utilizes the information learned. We received the game and the boys were eager to play. Since Isaac is already reading above the level of the game, he was able to be the "tutor" for Henry. Isaac's role was to support Henry in his play by modeling the method. If you've ever played a matching memory game with your child, then know that this isn't much different. Cards were laid out and the boys took turns flipping them over and trying to make matches. Each card has a word and the boys would say the word aloud. When all the matches were made, more cards were added the game was played again. Since Henry has some reading knowledge, the entire Level 1 was completed in under an hour. Isaac moved on to another activity, but Henry, after reading the book, declared he was going to play again by himself. He repeated the entire Level 1 game alone. I was very surprised how engaged Henry was in this game. This is the child that rushes through his schoolwork so he can get upstairs to play and listen to books on tape. He rarely takes time to do anything "school-related." He clearly saw this as a "game" and it kept his attention for almost two hours the first day. Later in the week he came to me with a library book and showed me several words that we in "his schoolwork game." I was also impressed with the simplicity of the game. There are a lot of cards, and the readers, but there are no tiny pieces to lose or game boards to set up. No annoying voices repeating letter sounds again and again. The same method is repeated for all the levels. Isaac at age seven enjoyed playing the game, as did Henry, age five. Margaret could even manage this game. At almost four, she wouldn't be able to read the words, but if she played with an older child she could easily make the matching and begin to internalize early reading skills. Sight word learning is very important, but does not replace phonetic instruction. This game is not intended to be used as a stand-alone curriculum, but makes an excellent supplement to any reading instruction. It would make an excellent educational holiday gift. I liked the game because I got a lot of matches. I liked the game because I just really like matching games. It was a little too easy though, but I still liked it. 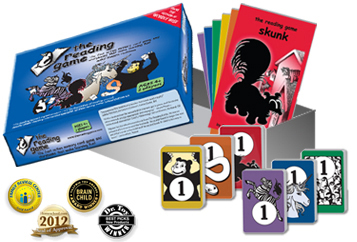 The Reading Game retails for $24.95 and can be purchased from The Reading Game Website. The set includes six illustrated storybooks, six decks of matching playing cards, and a teacher/parent handbook. Thank you to a special set of Godparents that made this possible for us! We love you!